Somehow it seems very weird that it’s Wednesday. A short week always does that to me! Anyway, for this week’s Wedding Wednesday, I wanted to share tips on how to have a stress free wedding day. I actually had a stress free wedding weekend and it was amazing. However, I know that is not always the case so I thought I’d share some tips so you can help ensure your weekend (and big day!) is stress free! Let people help you. One of the best things we did was hire our good friend Hannah to help with day of coordination. Hannah (and her colleague Tanya) did an amazing job and basically ensured that I had no worries from the time I woke up Friday morning until my head hit the pillow Saturday night. If you can’t hire a coordinator, then at the very least, enlist one of your organized friends to help organize things and keep the train moving during the wedding day. Trust me on this — you will really just want to spend that time with the friends and family who have traveled to be with you — don’t waste it stressing out over details that someone else can handle. Take a deep breath. I was pretty high stress throughout the planning process — I wasn’t crazy, but I was super organized and busy and just had a LOT going on. I told myself that as soon as I woke up Friday morning, I was going to let it all go and just relax. At that point, if something wasn’t done, it wasn’t done. The most important things to me were that we had the marriage license, our closest friends and family and each other. Everything else was extra. If you take this view, it makes it easier to not sweat the small stuff. Go with the flow. In the picture I posted above, my heels were sinking in the grass, there were gnats swarming and I was hot and hungry. However, I trusted Stacey, my photographer, to get a gorgeous shot and she did. You will have so much more fun if you let the professionals you hired do their jobs (note: sometimes the professionals you hired won’t do their jobs — in that case, get a vocal bridesmaid to take care of it!). I had the most wonderful, relaxing wedding weekend and I hope these tips will help you to do the same! love that pic of you in the grass-gorgeous! Deborah @ Confessions of a Mother Runner recently posted…September Tune up-Do you need one too? Great tips! We actually went to the Sandals in Jamaica and they did all the wedding planning and it was soo easy and stress-free. We just showed up! I loved every second of it. You were amazing and I’m thrilled you got to relax and enjoy your special weekend! Thanks for being my vocal bridesmaid 😉 I tried SO hard to follow your advice!! Also, the picture on this post is adorable! aw thanks lady! I was actually thinking of you when I mentioned how sometimes vendors DON’T do what they are supposed to do 🙂 love you! Ha! The funniest part was the ones we had complete faith in were the ones that ended up causing issues, and the ones where I was nervous wound up being fantastic. Oh well. It was still wonderful and you helped so much! Love you! Mar @ Mar on the Run recently posted…Rock n’ Roll VA Beach Recap! 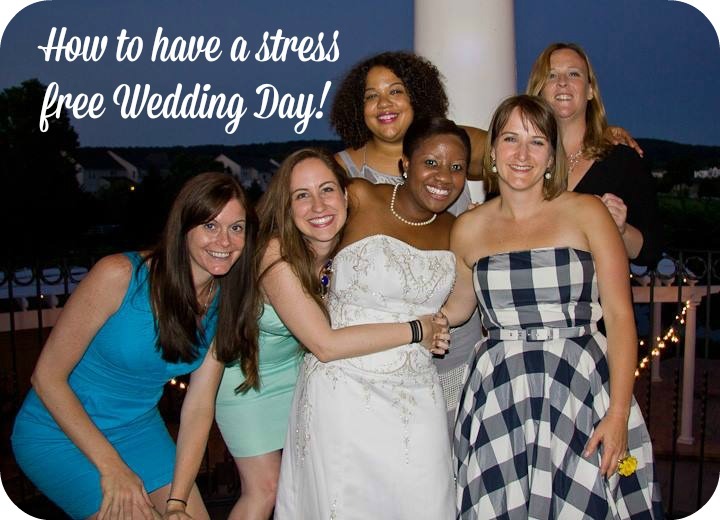 I think many brides do stress out about planning their wedding. It is very important to know that it is ok to ask for help. I think hiring someone day of was genius and so worth it. Another gorgeous photo! I would have never guessed there were gnats there! t be a bridezilla! Haha! But yes, it is always a great idea to delegate certain aspects of the wedding to people you trust. As long as they know their function and what’s expected of them, they will always deliver. Just know that you have prepared for your wedding as best as you could, so the moment you wake up on the day itself, let things be! This is a great post! I’m glad your wedding was a total breeze. Everyone should be smiling that widely and genuinely on theirs.